First off, I must admit that Joe Sargent is right–the red haired restaurant chef, Aiko, is shaping up to a main character as well, and perhaps a love interest for the “best friend” character Nobuse. 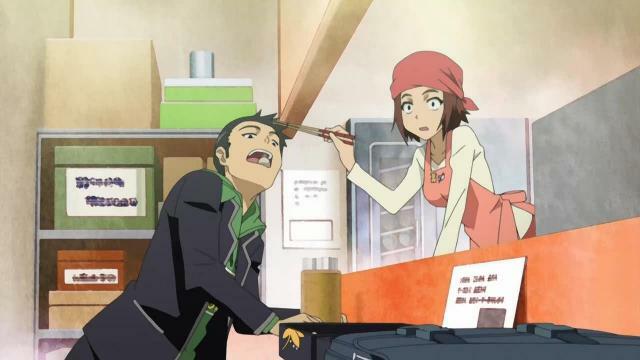 (Characters who are discovered in compromising positions almost always are in anime.) And what seems to be happening at the end of this episode is a little more complicated than a simple love triangle; looks like we’ll be getting the requisite crossed signals and misunderstandings that so accompany teenage romance, with, as the title wants us to believe, plenty of tears to come. One of the things I like best about this show is how little it draws attention to itself. It is like Kimikiss more than ef, even, at least on this front. Noe’s quirkiness, for instance, is odd and unbelievable at first, but in retrospect really isn’t all that over-the-top compared even to the worse moments of Clannad‘s Fuko arc (and that show on the whole is notable for its restraint). 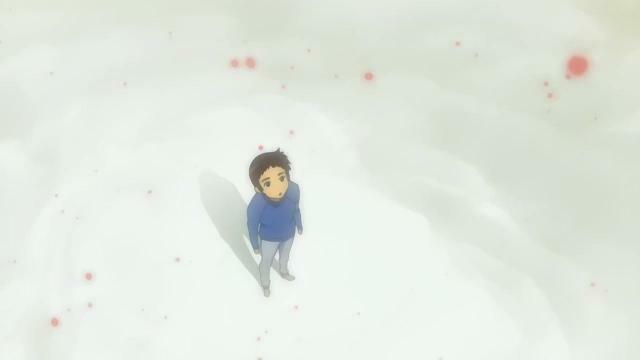 It tells its story straightforwardly and directly, leavened by wonderful visual metaphors whenever Shinichiro is fantasizing about the things happening in his life; I hummed with delight when I saw the bird seed snow come down as he remembered his childhood escapade with Hiromi. That flashback was genuinely sweet, too, because it was directed far less preciously than it could have been; the simple sight of both of them walking with only one shoe, holding hands, was enough to convey the emotional sense of the scene. Are we in Honey and Clover territory yet? No, not quite. The fantasy scenes come closest. But this is certainly the right direction to go. Glass eyed stares = MURDER in School Days! 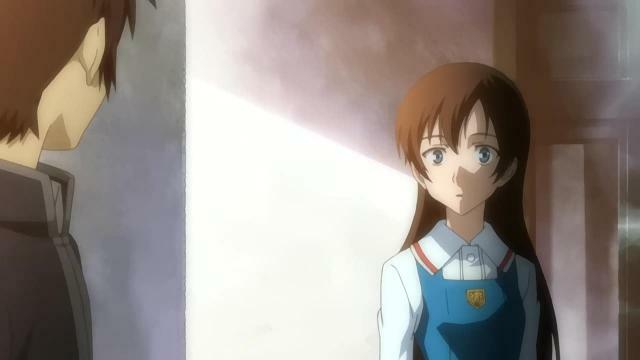 Ray mentioned the facial expressions on Shinichiro and Hiromi as they discover more about their love lives at the end of the episode. I agree that their emotions are clearly written on their faces in an impressive way. Right now, Kimikiss excels at that particular trait, eschewing monologues in favor of facial expressions (and rightly so). In fact, this show really does remind me in some ways of that show, with its restrained and quiet mood, beautiful backdrop animation, and relatively normal (Noe excepted) characters. It has a little more potential for heavy drama, to be sure. But that, in a odd way, makes it more realistic too: the time when most people encounter heavy emotions is during a love relationship of some kind, and the escapist appeal and the limitation of Kimikiss lie in the relative placidity of the romances. Especially given these are teenage ones. We really seem to be in the age of the dating sim/visual novel adaptation as the predominant form of anime, which I generally find lamentable. Nevertheless, just like with last season’s ef and Clannad, there’s often one or two decent ones out of the bunch, though I’d argue that their goodness is in inverse proportion to how much they are like every other dating sim out there. At their best, they can give us characters who are worth caring about and whose situations are universal (falling in and out of love certainly is), and add another notch to a relatively unique property of anime–male-oriented romance stories with some emotional truth to them. True Tears has some ways to go and some time before we can judge it to be among the better ones; and I won’t be expecting this to be Makoto Shinkai or H&C good, but as long as it stays simple and pays attention to character growth, it’d be more than fine. It’d be better than the vast majority of romance anime, period. And that’s worth giving at least one cheer. Previous PostTrue Tears 3 – tears from me…Next PostEpisode Reviews vs. Editorials: Why the Divide?